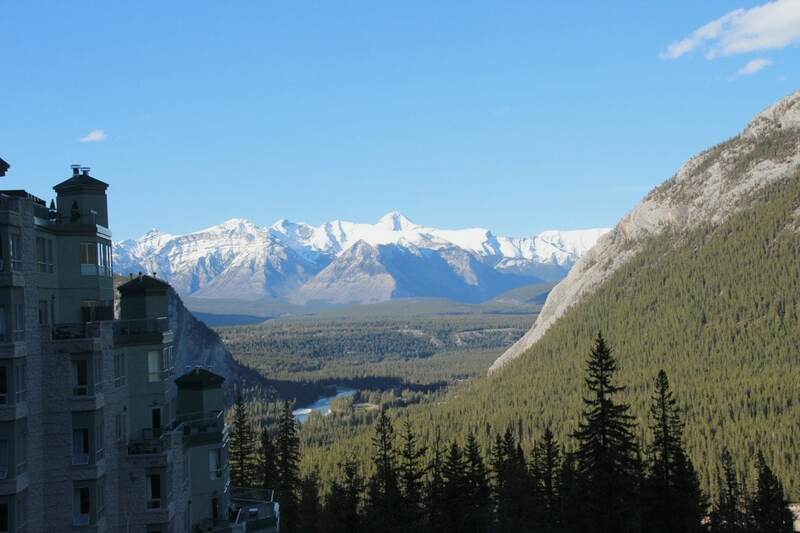 If you’re planning a getaway to this area, you’ll need to know where to stay in Banff. Downtown Banff offers mind-blowing scenic vistas, fabulous food, and more activities than you can imagine! A few months ago, while traveling on the Rocky Mountaineer First Passage to the West through the Canadian Rockies, we ended our trip with two days in beautiful downtown Banff. 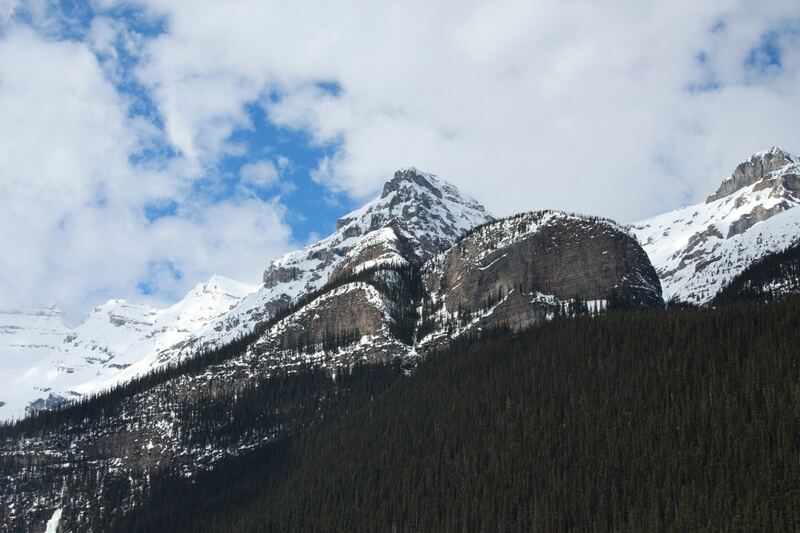 Those gorgeous views you see of the Canadian Rockies are often of Banff National Park. Stunning in the winter with snow-covered majestic mountains, you can ski, snowboard, and even ice skate. And though it’s gorgeous in the winter, it’s absolutely spectacular in every season! I was there in May and this is one of my favorite shots! The best place to start your planning is on the Banff Lake Louise website. You’ll find four seasons of things to do all year long on the site, so start planning early! Don’t worry about where to stay in Banff. The Moose Hotel and Suites is a gorgeous 4-star hotel just 15 minutes from the Banff National Park Gates and the perfect spot for a relaxing getaway. This was the hotel Rocky Mountaineer included in my trip, so I had a feeling it would be fantastic. The central location makes it so easy to walk around town for dining, shopping, and other activities. 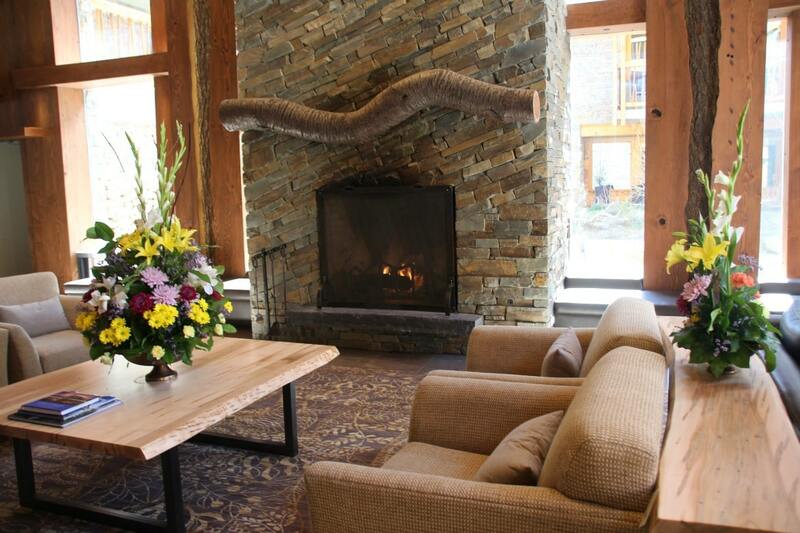 When you arrive at the Moose Hotel and Suites in downtown Banff, you will immediately notice the warm, inviting decor. The theme of mountain elegance really suits this property. The Moose Hotel and Suites includes all of the typical hotel amenities, and with more than 170 guest rooms there is sure to be something to suit the needs of every traveler. 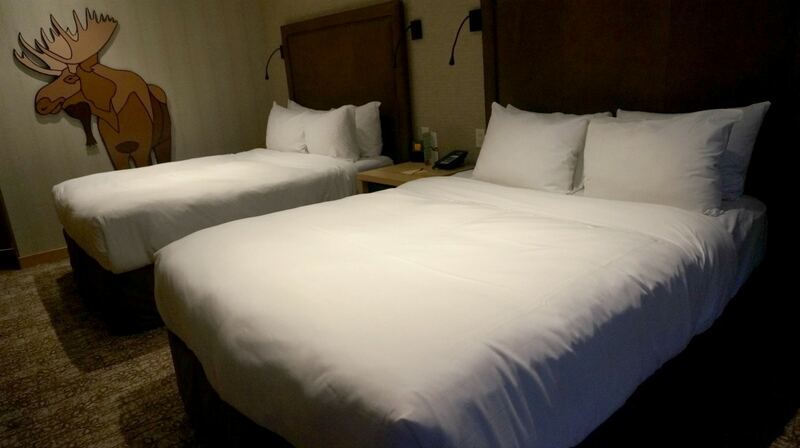 Standard rooms are equipped with either one king or two queen luxury beds and glorious Mountain Rain Showerheads. They are pretty much bliss after a long day exploring the region! 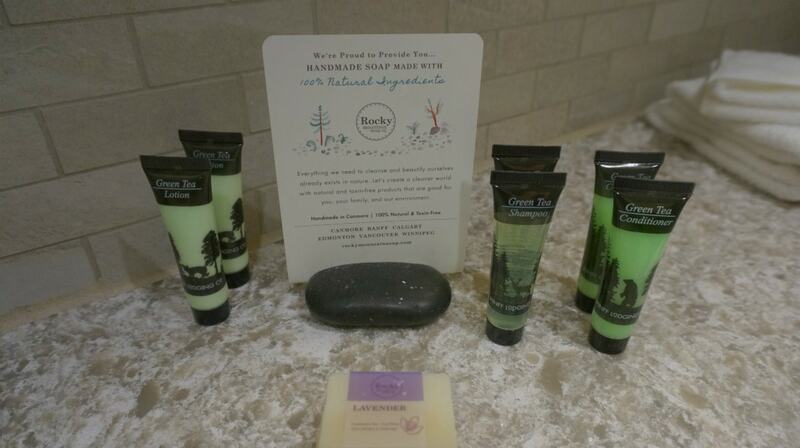 With upscale toiletries including local soaps, it was easy to relax and rejuvenate. Their suites offer fully stocked kitchens, bedrooms and feature gas fireplaces for some added coziness after a long day of exploring! 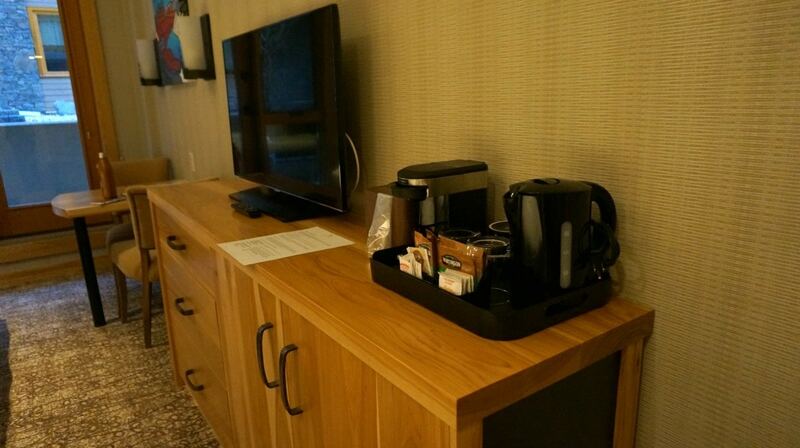 Of course, all rooms include free wireless internet access. Parking is complimentary at the Moose Hotel and Suites and if you happen to have an electric car, there are four Tesla charging stalls for guest use. The hotel is also pet-friendly! This fabulous hotel property features the Meadow Spa and Pools with ten treatment rooms, private outdoor hot pool, and a beautiful indoor swimming pool. 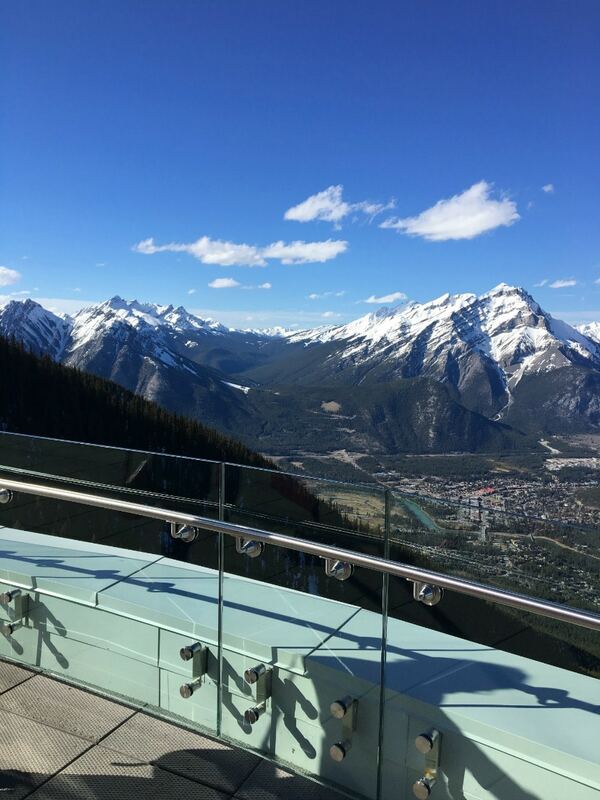 Their exercise room is located on the third floor and if you head up to the rooftop you can experience the hot pools while taking in views of the Canadian Rocky Mountains and downtown Banff. The hotel is located right in downtown Banff, so a short walk will take you where you need to go or you can make use of the complimentary Roam bus passes. Despite the busy location, the hotel is peaceful and reminiscent of a secluded hunting cabin. A great mix of modern luxury and charm. 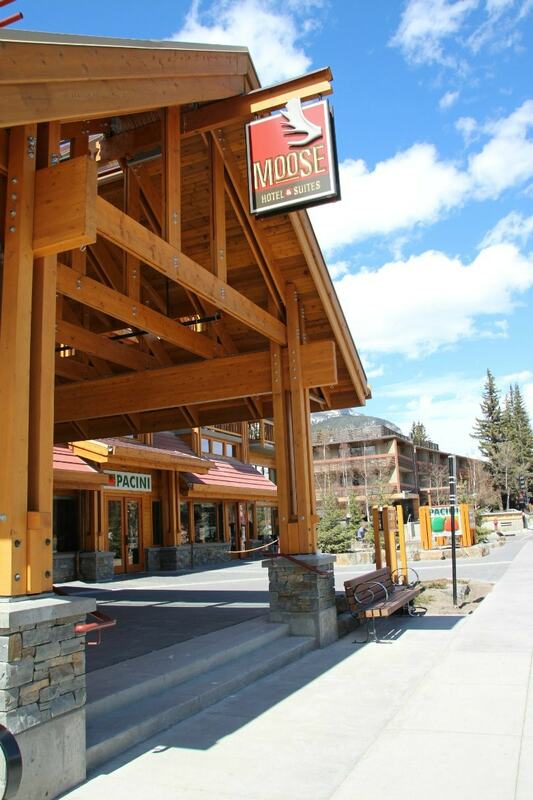 The Moose Hotel & Suites is located at 345 Banff Ave. You can easily reserve your room online, or give them a call with questions at 1 (866) 379-0021. It really is the perfect spot if you’re trying to decide where to stay in Banff. Getting there is easy: Take the TransCanada Highway West towards Banff. Take the first Banff exit and turn left at the stop sign. This will put you on Banff Avenue, the hotel will be about 5 minutes from the exit. Brewster Express is a great way to get around, too, instead of renting a car. Pacini: If you’re wondering where to eat, Pacini, the in-house restaurant, features delicious Italian cuisine for dinner as well as a diverse breakfast and lunch menu. Eat in or order room service. Saltlik Steakhouse: The Saltlik Steakhouse is about a 6-minute walk and is absolutely fantastic. We had appetizers and drinks there the first night we arrived in Banff and it was amazing. 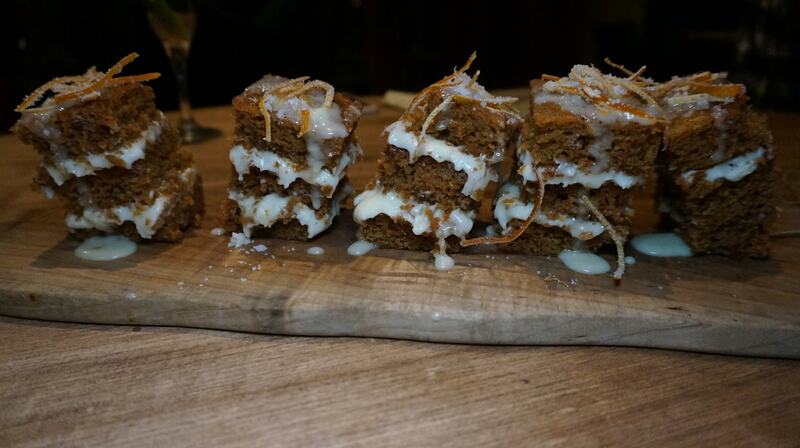 The carrot cake was out of this world! 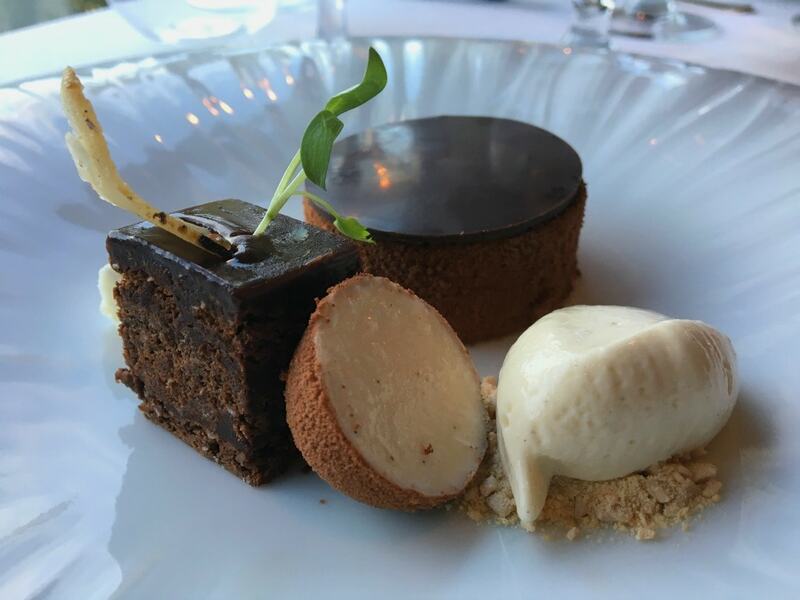 Eden Restaurant: Celebrating a special occasion or just looking for a really unforgettable meal? Eden, located in The Rimrock Hotel, serves French cuisine and is a very upscale fine dining experience. The food is incredible and the views spectacular. 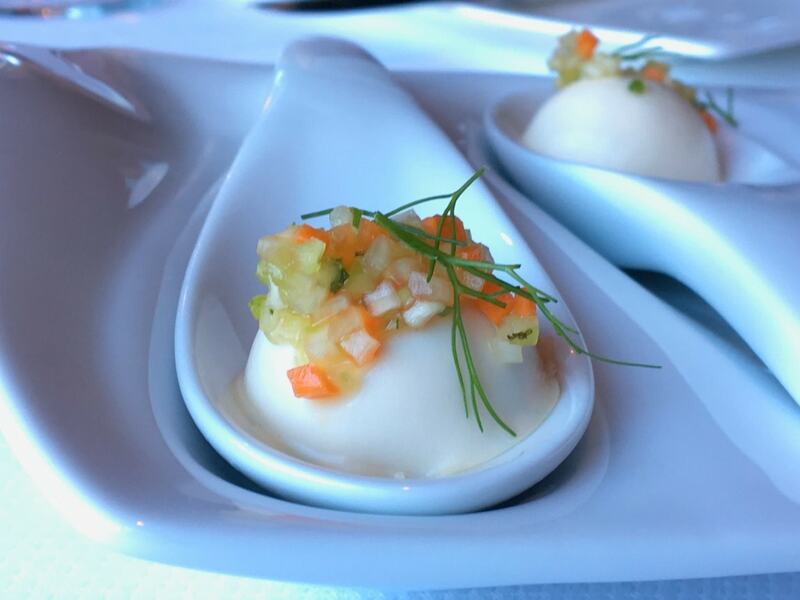 Our meal began with an Amuse-Bouche, which is a teaser of what is to come from the chef. The appetizer was Scallops with Saffron Garlic Puree, Hollandaise, and Edamame. Alberta Beef with wild mushrooms was served for the entree, and an assortment of desserts was presented after the meal, along with coffee from a French Press. 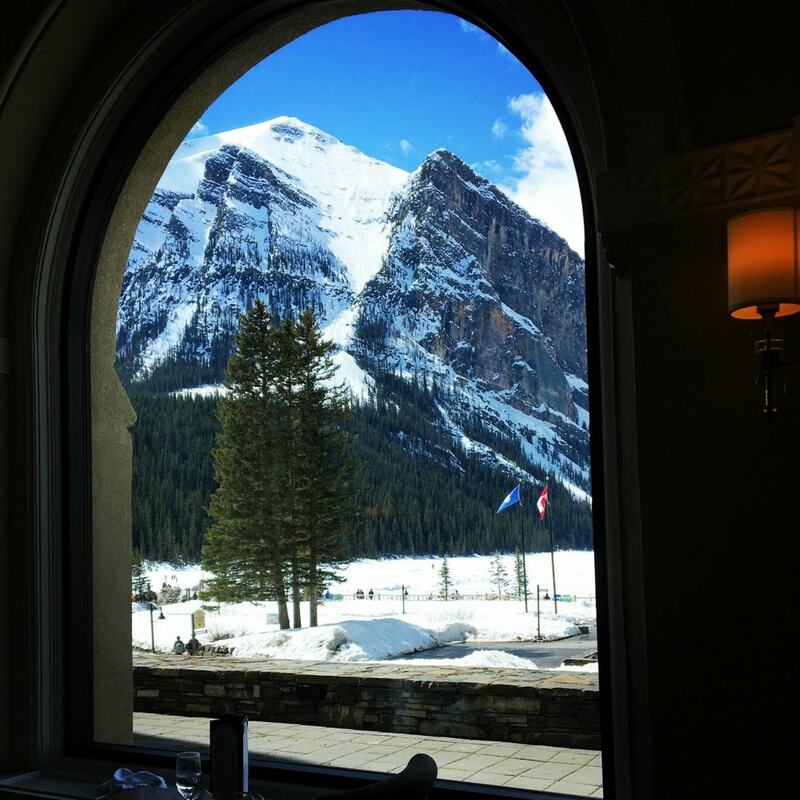 Fairmont Chateau Lake Louise: Lunch and dinner are both served at the gorgeous Alpine Social restaurant at Fairmont Chateau Lake Louise. This was the window just across from where I sat for lunch. 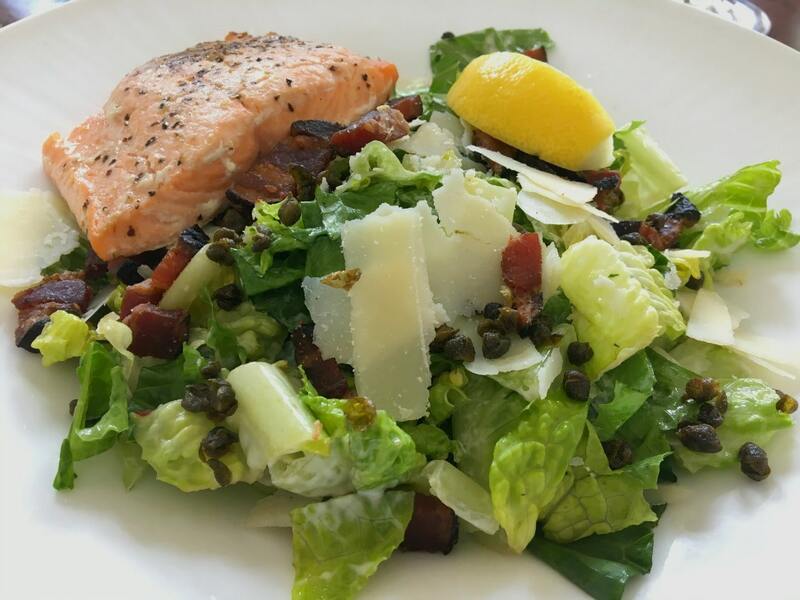 Salmon is one of my favorite foods and the Alpine Social has a fabulous Salmon Caesar. Ski: If you’re planning a ski vacation, the Moose Hotel and Suites offers a “Build Your Own Ski Vacation” package. You can book a two-night stay, add discounted lift tickets, and save 15% on your room rate. Lift tickets are Tri-Area passes valid at either Sunshine Village, Mt. Norquay, or Lake Louise Ski Resorts. 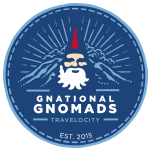 The tickets also include ski bus shuttle access, night skiing at Mt. Norquay when applicable, and even free tubing at Mt. Norquay. 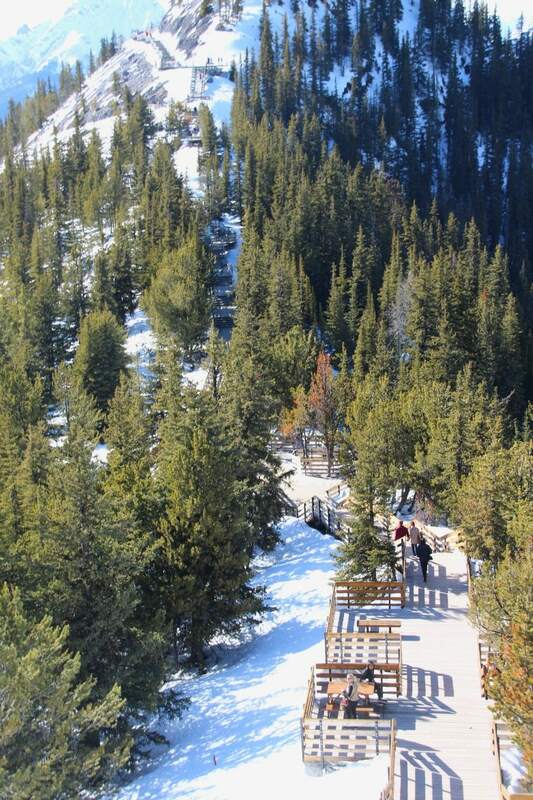 Gondola: Take the Banff Gondola up to the 360-degree observation deck. Don’t forget your camera! There is also a restaurant and a Starbucks. The views are unforgettable! Light Hike: If you’re feeling more ambitious, take a 2 km walk along the boardwalk. Be on the lookout for Rocky Mountain Big Horn Sheep! Adventure: Again, you can visit the Banff Lake Louise website for more hiking, boating, and adventure ideas and get your Alive Pass which you will need to enter the Banff National Park. Hot Springs: After spending the day exploring, you might want to check out the Hot Springs! This will have to remain on my bucket list for now. Be sure to pay a visit to downtown Banff. The area is so full of activities, the only thing you’ll be short on is time to do them all! 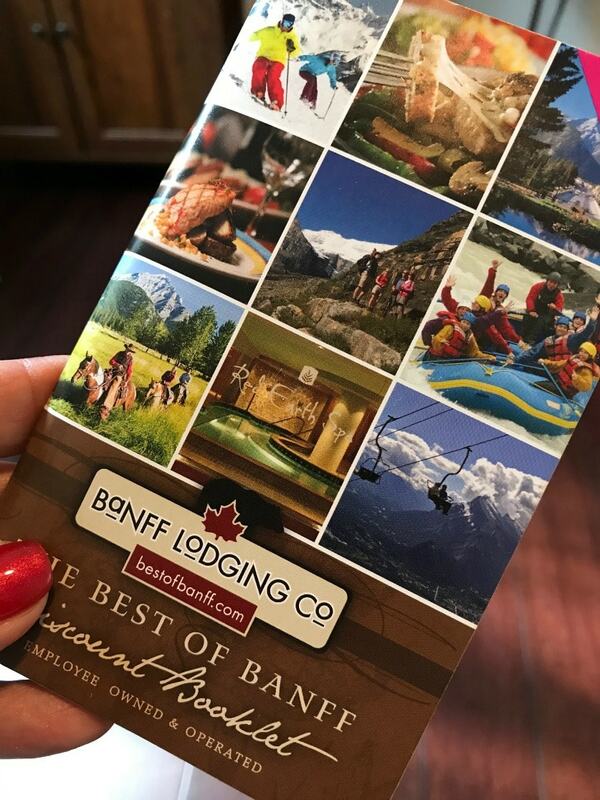 Ask your hotel for a Best of Banff discount booklet to save on food, sports, movies, and more. 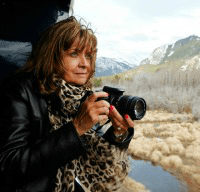 Rocky Mountaineer is a great way to see it and more of Canada! 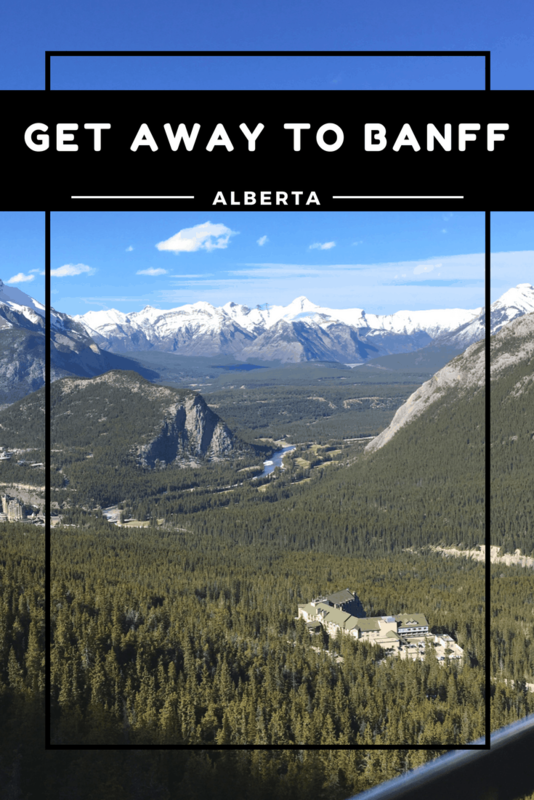 Have you been to Banff? I’d love to read about your experience. Share in the comments! Banff is so beautiful! I’d love to get there with the family one day. You can’t beat the beauty of nature. It really is spectacular, Stacie! Your kids would love it! Go! Canada is one of the most beautiful countries in the world. I’ve been there a couple of times, and I can’t get over how impressive the natural beauty of the country is. It’s really breathtaking beauty, Bill. And the best way to see it is on Rocky Mountaineer! I think your family would love it! This looks like an incredible place to visit. I really miss my mountains. I hear you, Meagan. No mountains in Florida, either! Banff is just amazingly gorgeous. Go! What a beautiful place to visit and all the food looks amazing. 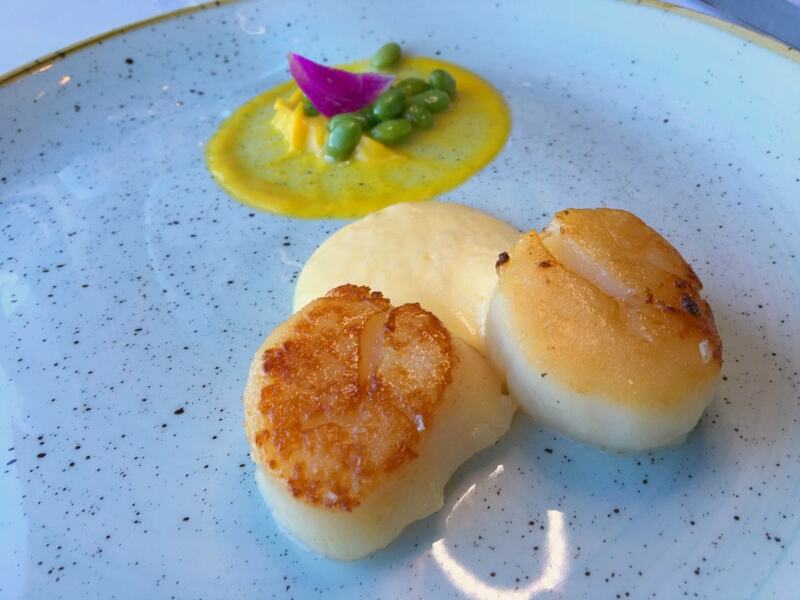 I would love to try the scallops with saffron garlic puree, hollandaise, and edamame. Yes, Catherine! Eden was insanely good! It’s pricey, but such an amazing experience. 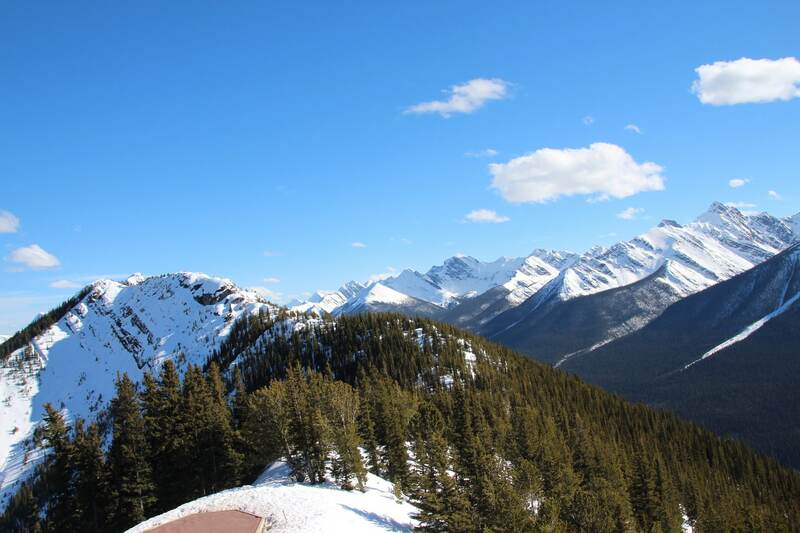 And the views of Banff are unbelievable! I haven’t been to the Rockies side of Canada yet, but it’s definitely on my goal list. 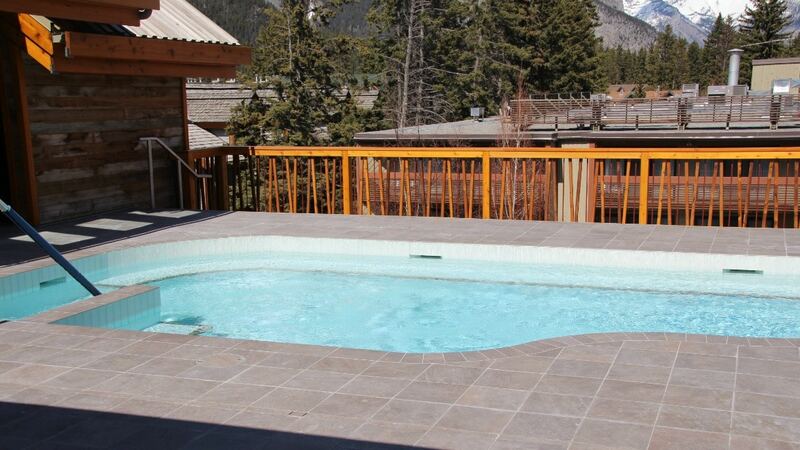 Banff looks like it has everything one needs to enjoy themselves- good food, great lodging, and breathtaking views! I’m working my way through Canada, Theresa, and I love so much of it! Vancouver and Banff are my favorites so far. The Rocky Mountaineer is a great way to see them both! Go! That’s such a cozy place to be! I’ve never been to Banff before but it’s definitely a place where you can just relax and not be bothered by the busyness of the city! So true, AnnMarie. It’s a very chillaxing spot! I’ve never been to Banff but I sure would love to one day. There are so many things that you can do there, which I love because my boys are pretty active and I’m sure they’re going to enjoy there! Yes, Jocelyn! Your boys would love it! Go! Looks like a great place to visit. Now to decide if we go in the winter or the summer. So much to do for either season. Wow! These look really fun! I can’t wait to visit and explore this place! I’ve never seen edamame in a dish. I’m excited to see it here (I’ve only had it for snacking). What a beautiful place! I haven’t heard of it before but will have to keep this place in mind for a great weekend! Alberta looks like a great vacation spot. The snow capped mountains are really pretty. There’s so much to see and explore! I’ve never been to Banff but I sure would love to! Thanks for this article. Now I know where to stay and where to eat if and when I get there. The views are fantastic!